Nido's on a CL owned by the Windmill Inn in the village of Great Cressingham, not far from Thetford. It's very quiet in the middle of nowhere, but with a 4G signal far better than our close to town location at home. The morning brought an overcast but warm start. I made us a cuppa before popping into the village for some food. I found Roys Supermarket (what else!) in the Food Hall building. It was like being inside a French one - lots of items I'd not seen before, pleasingly much of it local produce. They also had a good wine selection and I bought a French rosé for tonight. Breakfast done, everything stowed away, we drove through heavy rain to this CL. I checked in at the pub, which looked lovely, but we don't plan to use it as we have all we need in the van. Our favourite 'en-France' lunch of baguette, rillette, cheese, salad and fruit were enjoyed and I caught up with the world of Twitter and read while Cathy had a snooze. The showers continued on and off, but we were happy to chill out in the silence of the countryside. Dinner tonight was grilled pork loin chops, new potatoes roasted in garlic and olive oil, and some tinned haricots verts from France. The rosé complemented our meal. The rest of the evening was spent reading, blogging and chatting about our future plans, before turning in, ready for the long drive home tomorrow. The usual long drive home, clean the van inside and out and return him to his storage home. 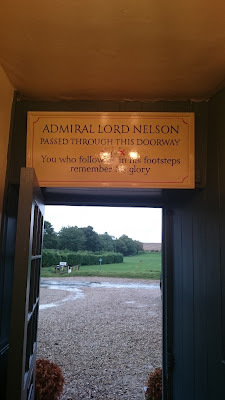 We enjoyed parts of Norfolk - the peace and solitude of the salt marshes, sea swims, the big skies, catching up with family, paying a personal homage to Admiral Lord Nelson's home village. But we felt Norfolk was a bit behind the times, a bit set in its ways. It caters well for the older pensioners but it's not an area we'd want to live. We love the variety of coast - sand, rocks, cliffs, coves, and mountain. So we think our future lies in a different area. We have something in mind and it's exciting us. We need to do some research and see where this takes us, but our focus is now on a particular area. 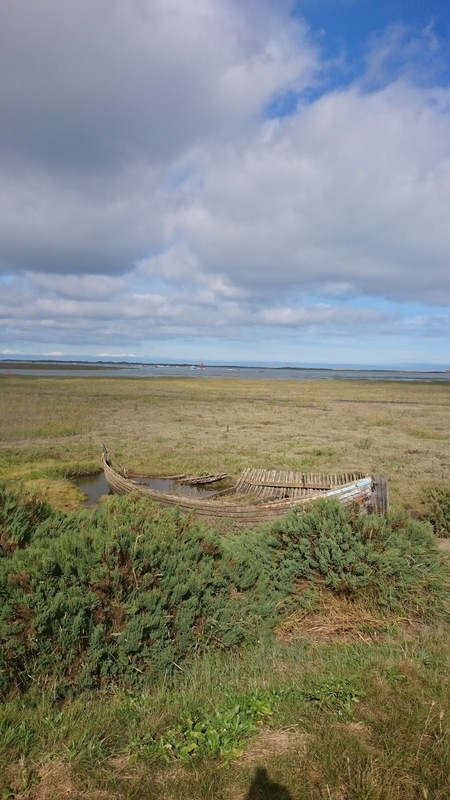 It's too premature to say where, but we think it'll give us what we crave - easy access to the coast and mountains, good local produce, great countryside and the opportunity to develop another great garden to enjoy our outside lifestyle. Nido's parked up on what I would describe as a small aire, alongside the river at a marina in the heart of Wroxham. We have a lovely spot to sit outside and watch the holidaymakers crash their hire boats! 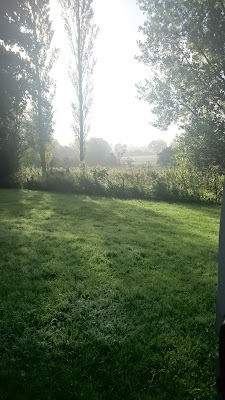 A lovely still, warm morning saw us sat outside eating bacon and eggs. Our plan today was to hire a rowing boat from Whispering Reeds, just around the corner from the pub, taking a picnic to enjoy on the water. But on arrival we were told it was too windy and I could see it probably was for a rowing boat; our breakfast spot was well sheltered. So it was back to the van to consider options. We thought of cutting the holiday short. The Broads were difficult to see without a boat (obvious really!) but there was also a severe shortage of footpaths in the area. Also we'd seen most of what we wanted to along the coast. But in the end we decided to carry on. So a replan saw us head to Blickling Hall NT property, for a look around the gardens and a walk by the lake - not too exciting but choices were a bit limited. After this visit we drove to the aire at Wroxham. It's a few minutes walk from the busy centre but very quiet, with space for up to five vans. On arrival, the warden Cheryl - a lovely helpful lady - told us it had recently become a C&CC CS. We're not members but she let us stay. Settled in, we walked the short distance over the river bridge into town to do some food shopping. If you've never been to Wroxham, 'Roy' seems to own everything. 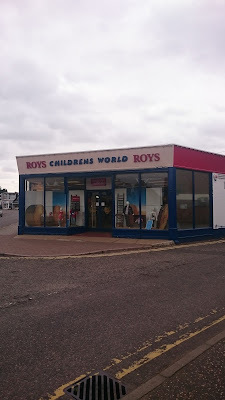 Almost every shop begins with 'Roys', even the toy shop. 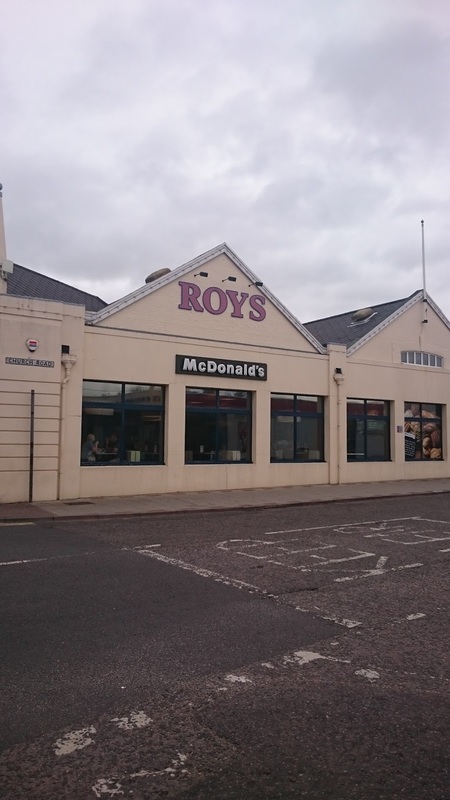 There is a McDonalds with the usual sign and Golden Arches, but it's in a building owned by Roy - and his name appears above theirs on the building! I remember all of this from my visits here over 40 years ago. I wonder if Roy's still alive? I wonder if Roy ever existed, or it was just some mad marketing ploy dreamt up in a Norfolk pub. I imagine him to be a short, fat, bald ol' Norfolk boy, a little like Boss Hogg on the Dukes of Hazzard. I'll need to Google 'who is Roy of Wroxham' when I have a signal! [Roys was founded in 1895 when brothers Alfred and Arnold Roy opened their general store in the village of Coltishall. In 1899 a second store was opened in Hoveton. It remains a family business and uses the motto "The World's Largest Village Store"]. On the way to the small supermarket we saw a Thai restaurant. That's tonight's dinner sorted - a takeaway back at the van. Cathy showered in the van while I tried the marina facilities. 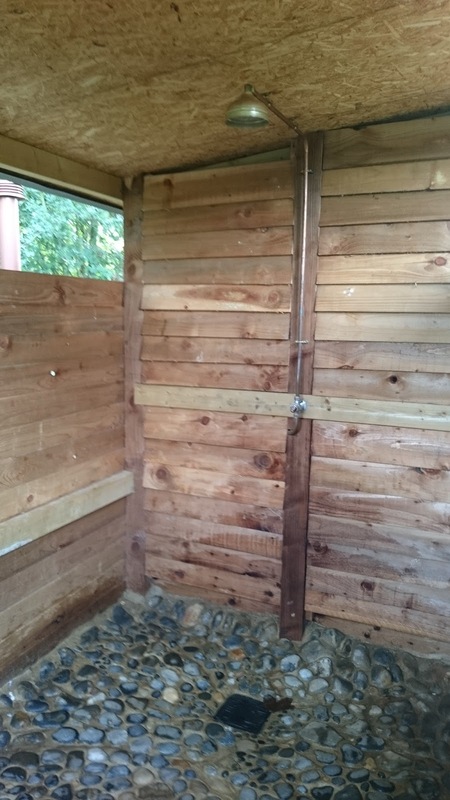 It was an experience - a porta cabin, three 20p coins for the meter and an uncontrollable shower that almost flooded the place out! Still, I emerged clean and managed to utilise my past Royal Navy damage control skills to remove the flood and prevent the porta cabin sinking. We sat outside watching the world go by with a drink, chatting to our neighbours, accompanied with two lovely little dogs who enjoyed the treats we keep in the van. I ordered our Thai meal - only an hour's wait - and sat outside with a drink until it was time to fetch our meal. The restaurant was only a quarter full and there seemed to be more staff than customers - too many cooks...? The meal was OK but I suspect any hint of chilli or garlic has been dumbed down for the local taste. We sat outside until quite late (for us!) in a warm breeze. Good ol' Roy - keeping his name above McDonalds! 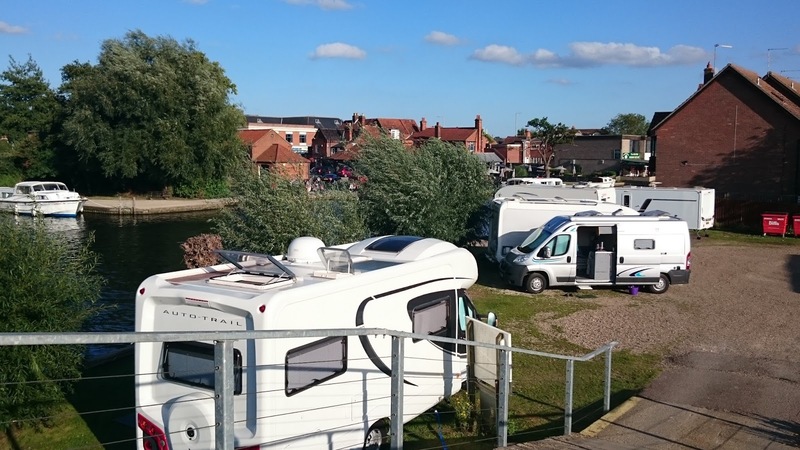 Nido's parked up between other motorhomes at a lovely Britstop pub on Hickling Broad. I can hear the wetland birds in the background as they settle for the evening. We woke early to bright sunshine and a warm wind - yay! Breakfast of poached eggs on toast was enjoyed sat outside. 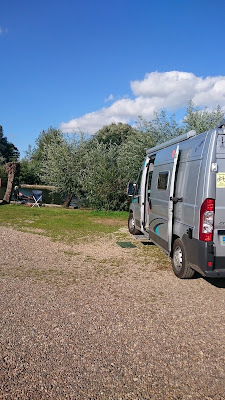 As we were on EHU we charged up 'all the things' overnight and enjoyed another cuppa sat out in the sunshine before driving along the coastal road to Sea Palling. We'd been here many years ago for a quick visit but never stopped any length of time. 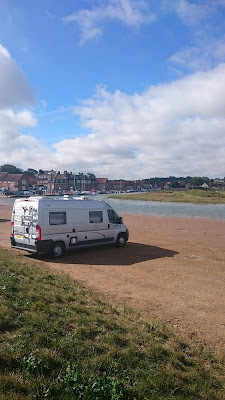 We parked up in the large long stay parking field, along the base of the dunes - perfect for motorhomes - £7 for the day. 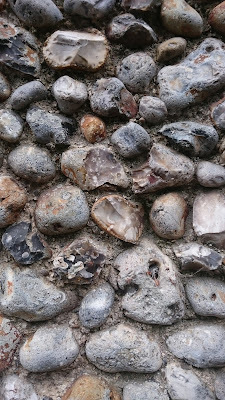 I've been able to pay for all car parks here using a card, rather than faffing about with a fistful of coins. I wish more councils would take note. Bags packed, we walked the short distance to the very clean and white sandy beach. 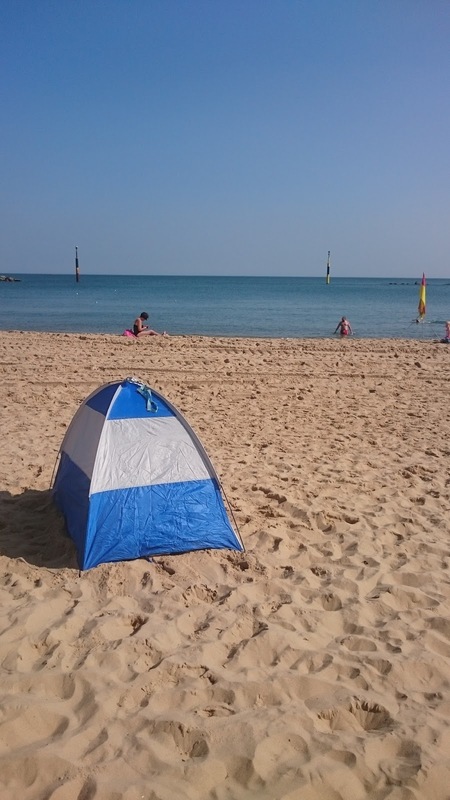 It's a lovely spot and, once our beach shelter was up and everything zipped inside, we walked into the sea. The RNLI Lifeguard information board said the water temperature was 16'C, but it felt warmer, helped by the hot sunshine. We enjoyed a good swim and chat before walking along the beach line - with the calm sea, white sand, blue sky and hot sunshine, we felt we were in Spain, not East Anglia. We collected some seaglass and driftwood as we walked along the tide line to dry off. Returning to our beach shelter I was surprised to see this guy had set up his chairs and table less than 2 feet from us, blocking the entrance to our shelter, despite the size and emptiness of the beach! I told him so and was ignored, so after a few choice words of 'anglo-saxon' (I know a few East Anglian 'words' having grown up near here!) I moved our shelter away from this idiot and his partner. The rest of the day was spent sunbathing, reading, swimming and walking along the beach. Lunch was fruit and water, with tea and biscuits later. About 1600 we returned to the van; it was still hot and sunny and we sorted out our kit on the warm, dry grass while the water heated. We enjoyed lovely showers onboard Nido before I prepared and cooked dinner - Greek salad, boiled new potatoes in olive oil and garlic, pork sausages. We sat outside the van with linen napkins of course (standards) and nearly the whole field to ourselves. It's a shame no overnight sleeping is allowed. The Council are missing out on a huge income stream and we'd have visited the beachside pub in the evening, so the local economy would have benefited. 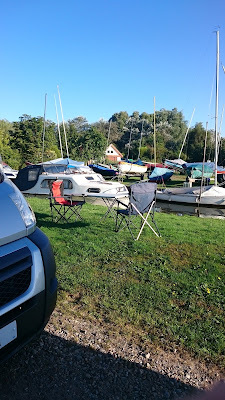 Instead I'd booked us a slot at Britstop #248, a lovely waterside pub by Hickling Broad - only 10 minutes drive from the beach. On arrival four vans were already parked up, but there was room for us too, parked alongside one of the cuts with small wooden sailing boats moored alongside. 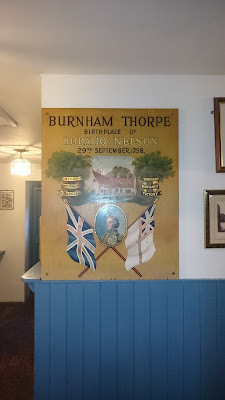 I popped into the pub to check in, before we had a short walk to look at the water. From here, though, views are limited - it's a very large Broad but best (and in most cases only) accessed on the water. Back in the pub we ordered a pint - Doom Bar for C and Nelson's Revenge for me (a pint I enjoyed in the Lord Nelson on Saturday night). Cathy also tucked away a lemon curd sponge and custard - I was good, just pork scratchings for me! By 2000 we were back in Nido, tired after a hard day's chillin'. Tomorrow we hope to explore some more of the area, hopefully on the water. We escaped! We were awake at 0600 and quietly dressed in our civvies, checked our forged papers, revved the engine and drove full pelt out of the main gate, crashing the barrier and dodging the guards' bullets as we fled. Actually we did wake at 0600 but lay in bed reading until 0800! Only then did we get dressed, open up the blinds and prepare to leave. A few other prisoners - I mean campers - were out and about, so I saved the great escape for another day. 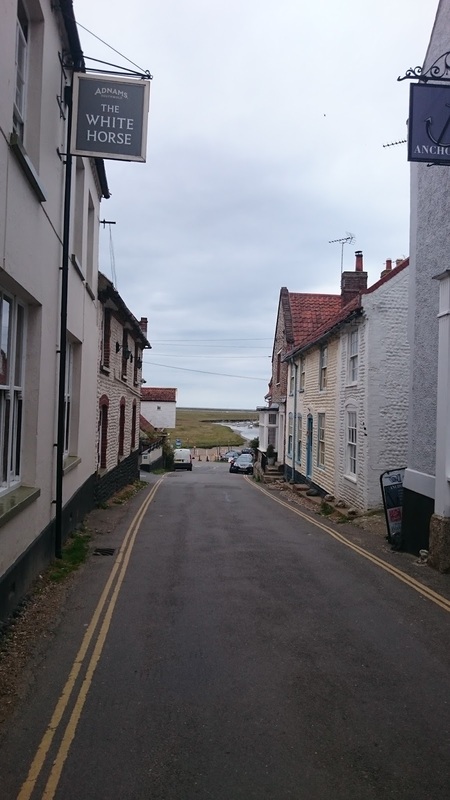 We drove a few miles down the road to the empty car park at Blakeney, reversing in at the far end. 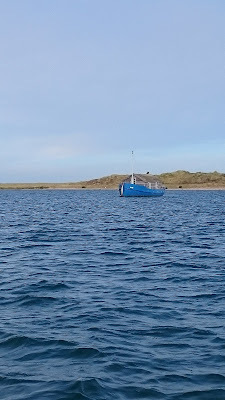 Cathy prepared our bacon and egg buttie breakfast while I watched the various yachties arrive for a day on the water. It was an hour and half until high tide. The water was still pouring into the creek and up the harbour at a rate of knots and, as it gradually crept up the edge of the sloping car park, I did get a bit twitchy. But with locals parking around us I felt reassured. We walked into the village, first stopping at the Spar to buy a few victuals, then next door to the fish shop for a couple of dressed crabs for tonight's dinner. Back at Nido we made up some lunch, put water in our two flasks, packed our swimmers and a towel and started walking. The route took us along the Peddars Way and Norfolk Coastal Path, walking along a flood embankment with salt marsh either side. It was already very hot and sunny - it was already 19'C when we escaped from Stalag 19 just after 0800. As well as seagulls we saw Egrets, Oystercatches, Terns and a Lapwing. There was a herd of cows on the marsh and I was disappointed to see no sheep - saltmarsh lamb is delicious! The path horseshoed out towards the sea then back inland towards Cley. We could see Wiveton Hall (if you watched the series about the Hall, its eccentric owner and his attempts at increasing his income, you'll know what I mean). Once into Cley we walked past a great looking green grocers and deli before taking the path past Cley Windmill (offering exclusive B&B and self-catering accommodation) before heading out towards the sea again. 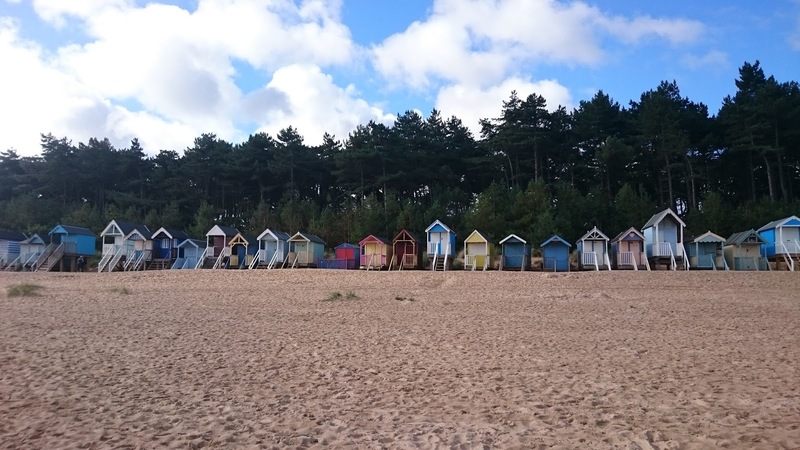 We soon reached the car park by the shingle beach, found our spot, changed and leapt into the sea - it was wonderfully refreshing our first swim in Norfolk. We swam and floated in the cool sea water and were surprised that we were the only ones. We even saw people in fleeces and coats!! We sat on the shingle drying off and eating our lunch, before changing, not easy with so many twitchers around carrying high-powered telescopes! 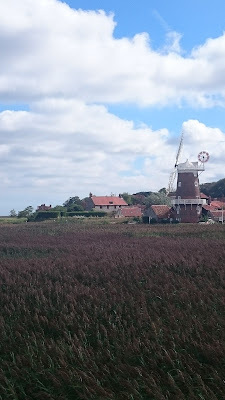 We reversed our route back to Cley and stopped at the Deli. It's one of those dangerous places where I could easily spend a lot of money! But I restrained myself to some peaches, oranges, a lemon, chilli and dried pasta (to go with the crab) ...oh - and some baklava and a couple of Portugese tarts that also fell in my basket. On the way around I tasted the various pickles, chutneys and tapenades available to try, so it was no wonder Cathy thought I'd got lost when I eventually emerged. We continued our walk up the A149 and were soon turning into the entrance for the Wiveton Hall café and farm shop. 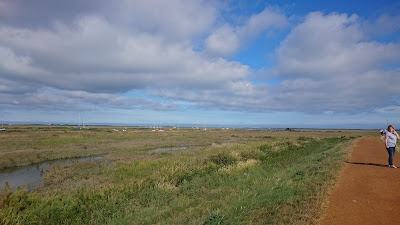 We'd seen the place on TV - the café and outside terrace had a great view over Cley marsh. 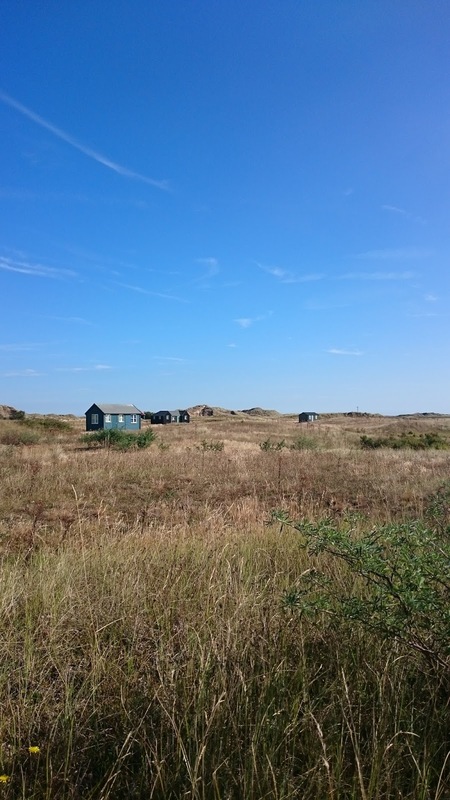 We only wanted a tea and coffee, but the lunch service was still going strong and space was at a premium, so we continued along the track towards Blakeney, passing the staff quarters - mainly old caravans! He has many foreign people over to help harvest the crops and work in the café and clearly he treats them well as many return for the season year after year - that and the fact that the locals don't seem much interested in crop-picking work. I wonder what he'll do when we finally leave the EU? 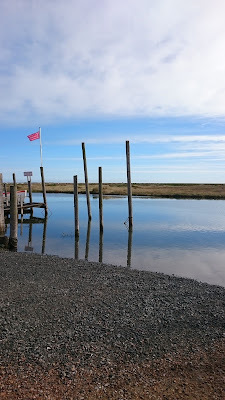 Back in Blakeney, Cathy made us a cuppa and we took our chairs (accompanied by my two Portugese tarts!) and sat by the creek, watching the bird life and the huge expanse of sky. 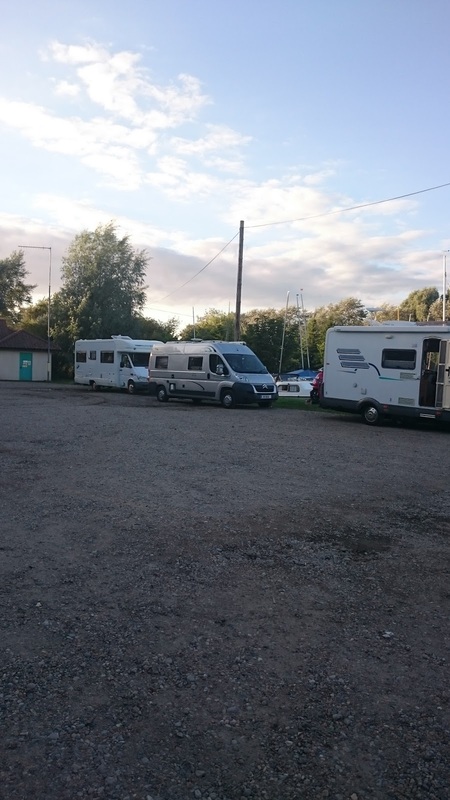 Our stop tonight is at Foxhills Campsite in Weybourne. It's next to the Mickleborough Collection which (I think - I need to check) is a military museum. This is a lovely site - immaculately kept, lovely large pitches with EHU and great hot showers. And several pounds cheaper than Stalag 19. So out came the awning and chairs for a cuppa, followed by long showers and sat chilling in the sunshine with a G&T and beer. 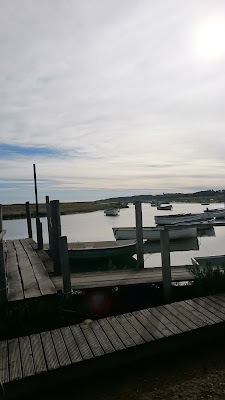 On the way here I'd stopped at a roadside stall to buy some samphire, which was delicious with our crab, chilli and lemon pasta - all washed down with an excellent value bottle of chilled Muscadet from Spar. The baklava was also good - I enjoyed mine with a good strong coffee. This has been a very relaxing day, which included a sea swim and something North Norfolk excels at - crab and samphire. It's a lovely warm evening as the sun sets, the crows are roosting noisily in the trees and we feel very relaxed. 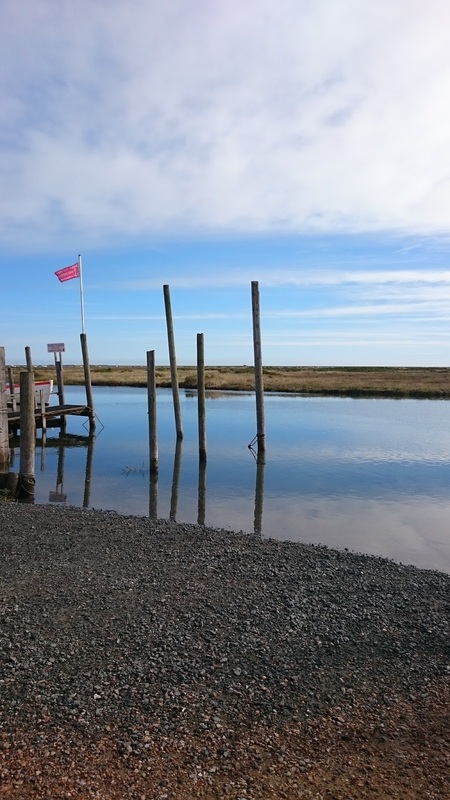 After a quick breakfast we drove to the NT car park at Morston Quay, ready for our trip with Beans Boats. 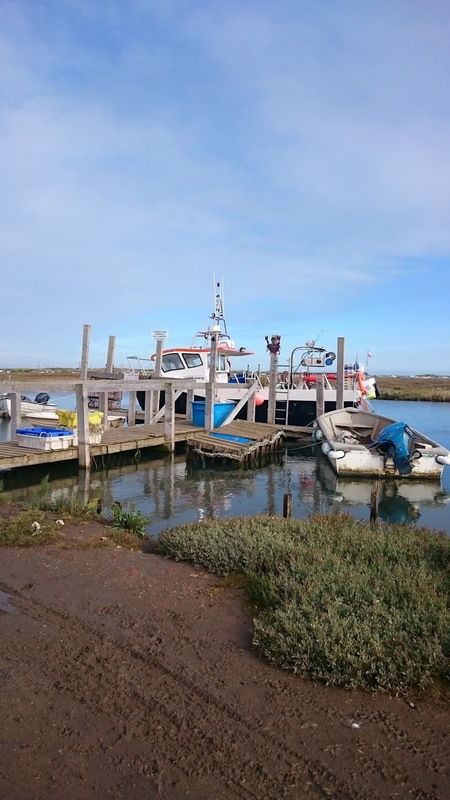 I'd booked the 0945 trip as it included half an hour landed on Blakeney Point. We piled in with about 22 other people and headed down the creek as the night tide turned. The two boatsmen gave a good commentary and some history of some of the boats (called pirate ships and arks for the sake of the children!) 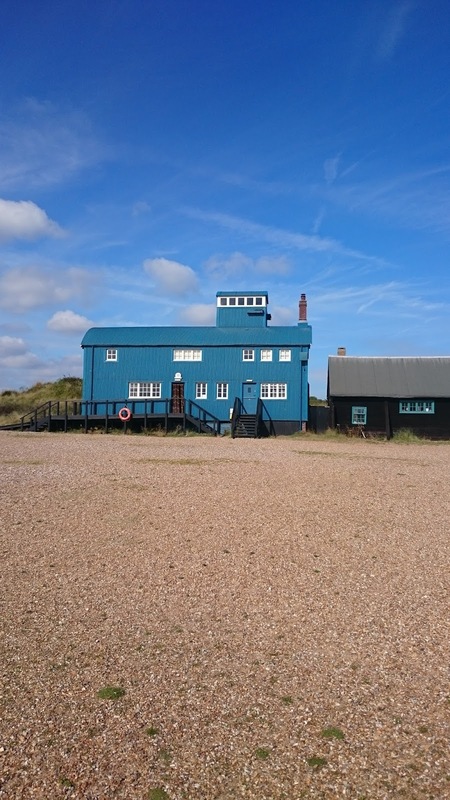 as well as the old lifeboat buildings on the end of Blakeney Point; we'd seen these on Countryfile and we're looking forward to a look around. 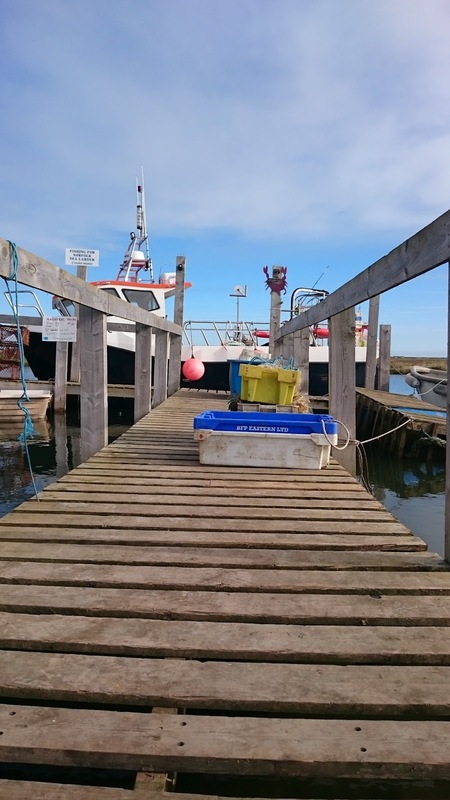 The weather was calm and sunny, a marked difference to yesterday's very strong westerly winds. 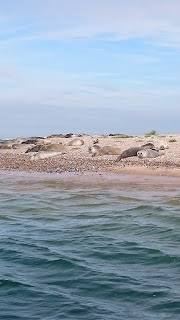 The boat took us to see the common and grey seals on the pebble beach at the end of Blakeney Point, with some swimming and popping up around us. 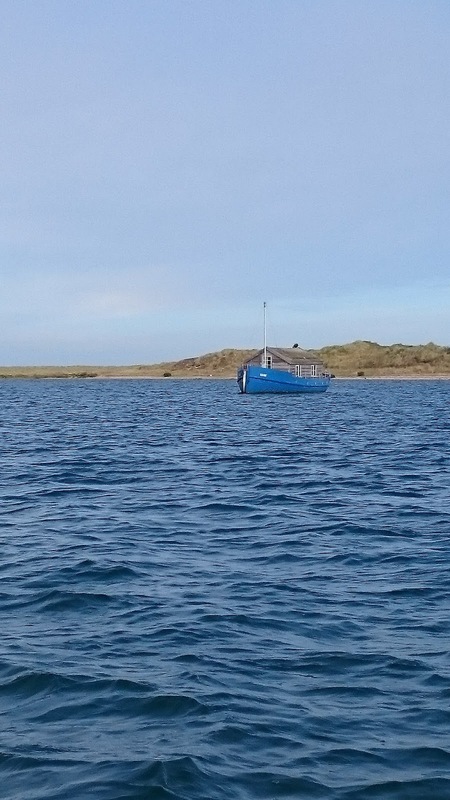 We did 6 drive pasts so both sides of the boat had plenty of time to take photos, before turning back into the harbour and landing on the shingle beach for half an hour. 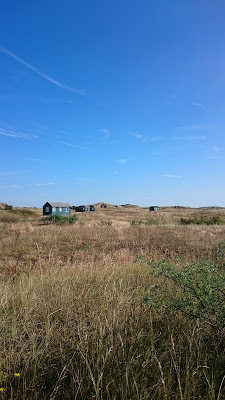 It was very warm as we walked in along the pathways, through the dunes and up over to view the open sea. We'd have loved to have spent the whole day here, watching the bird life and the sea. It was a quirky area, with a few small huts where the NT Wardens live all year round in relative solitude, plus looking after the large blue old lifeboat station, which now houses the visitor centre. 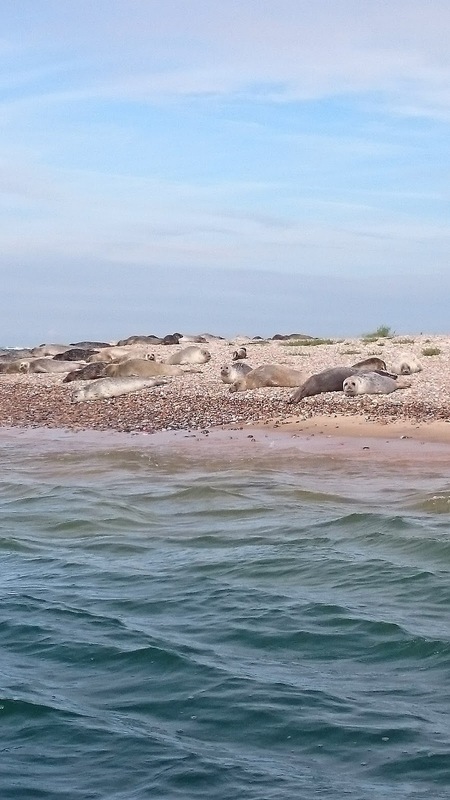 They spend a lot of their time observing and counting the seals and birds - not a bad life. 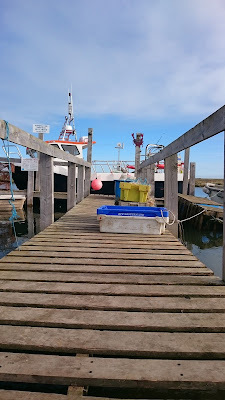 The half hour soon passed and we returned in a different boat to Morston Quay. I'd highly recommend the Beans Boats trips - good value for money and funny, informative boatsman. 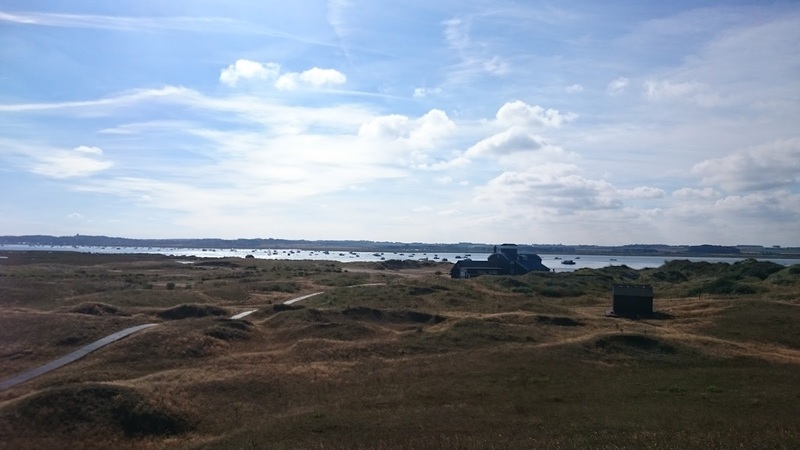 Back at the van we made our lunch and sat at one of the picnic tables with a cuppa to enjoy the sunshine, before heading off on a walk around the salt marshes to Blakeney Harbour. We had a walk around the narrow streets and found the Spar shop and seafood shop for tomorrow. I also noticed the harbour car park is free to NT members - result! We retraced the route back to Morston and drove to our stop for tonight - Highsand Creek campsite in the village of Stiffkey (pronounced 'Stewkey'). 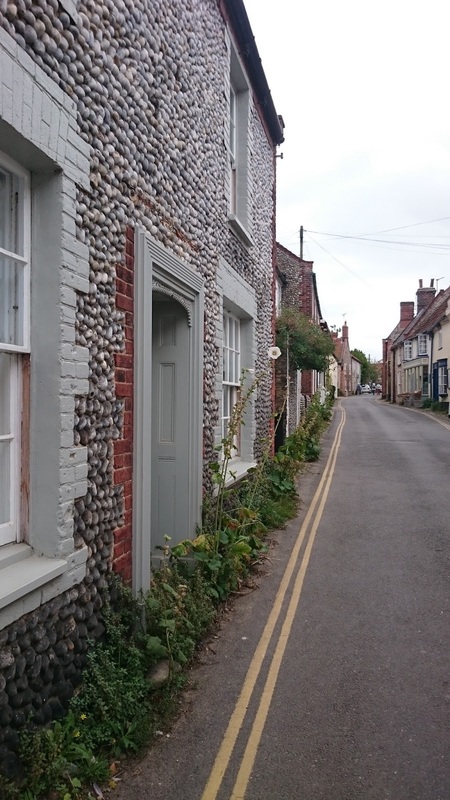 The Stiffkey cockle is famous for its dark blue shell and meaty mollusc. Unfortunately this was a poor choice of site. At £23 without electric hookup, it was the most expensive place we have ever stayed in the van. We were allocated a grass pitch, all of them laid out in a strict grid - ours was C4. The campsite is large with tents on one side and motorhomes on the other. The latter was quite empty but all the vans were allocated pitches next to each other, so we all huddled together in one area, while the rest of the campsite was empty. All around were old-style hangars - it felt (and looked) like a WW2 military camp, hence me calling it Stalag 19! I thought perhaps they'd be a 0500 roll-call, complete with searchlights and guard dogs, when we would be roused from our beds and made to stand to attention at the front of our vans and shout out our pitch number, just to make sure nobody had escaped in the night! The facilities block were also a little tired and smelled of sewage. Cathy braved the showers first and came back drenched - the shower was so strong the jet of water hit the back of the door where she had hung her dry, clean clothes. The cubicles floors also seemed to slope the wrong way so that all the water escaped under the door - the only thing to escape that night!! I had a similar experience, although managed to keep my clothes dry. I prepared a Greek salad for dinner, while scooping a couple of strong G&Ts. We had this with some lamb steaks cooked on the Cadac and sat outside in the warm, humid air. 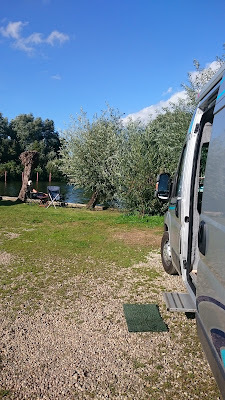 A bottle of vinho verde kept us the right side of sanity and once it was getting dark, and a gentle mizzle started to fall from the grey sky, we retired to our prison hut - I mean van bed! There was much whispered talk of digging tunnels and jumping the fence in the van, but in the end we just fell asleep. 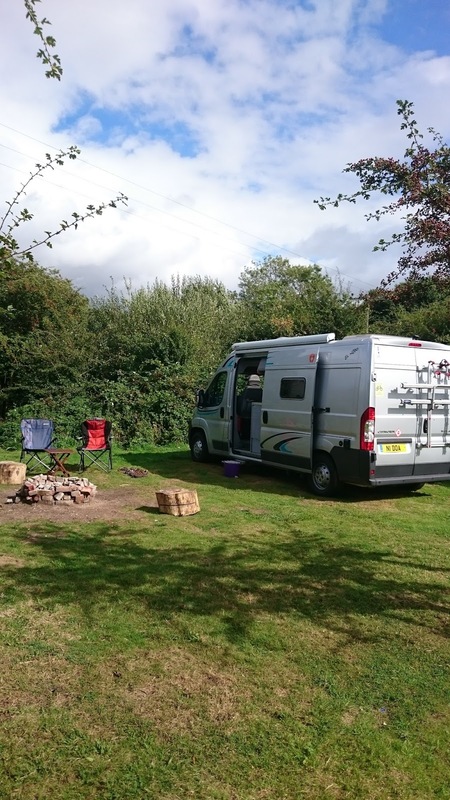 Nido's parked on a large private pitch surrounded by blackberry bushes, fruit trees and deciduous woods. 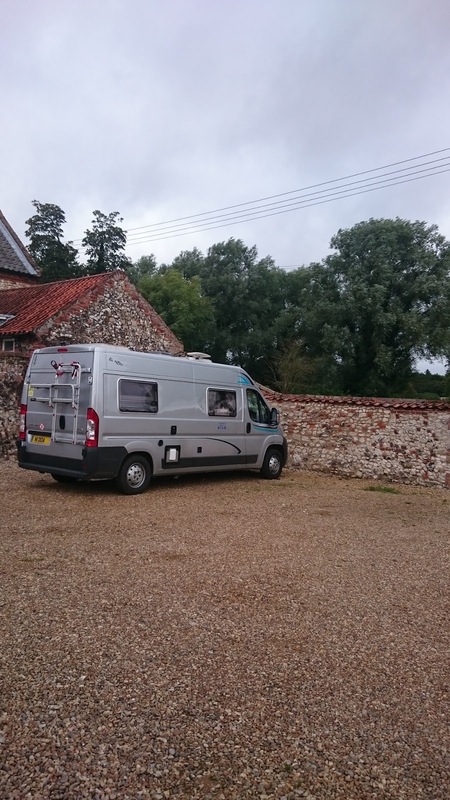 We're on the Norfolk Brickyard campsite, with several individual pitches tucked away. It's a quirky site, with a drop loo and an outside shower - the original was a bucket with holes in the bottom but the new one is gas fuelled, still partially outside and with a sign on rope to say it's in use - no door! 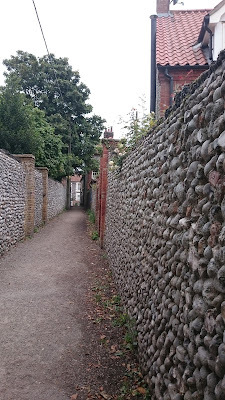 The campsite was a brickyard from 1720, using local clay to make and fire bricks. The owners have been here for 20 years and have gradually reclaimed areas of overgrown scrubland to create the private pitches. Cathy has already 'scrumped' some blackberries for pudding! After breakfast this morning we left the Lord Nelson, with the satnag taking up some dubious, unmade farm tracks, despite being set not to. Eventually we escaped on to the main road and soon turned off into the Holkham car park. Being such a touristy area, all the car parks charge and they're not cheap - £6.50 for this one. 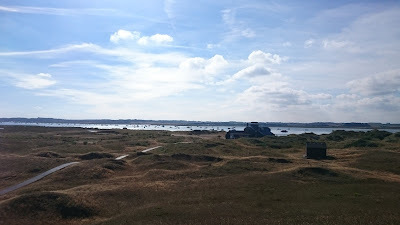 But we were soon through the pine forest and looking across the dunes, salt marshes and small lagoons towards the sea. 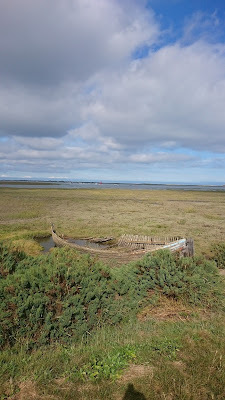 We turned right and walked along the water's edge as the tide started to fall, watching the various wading birds ready to hoover up any food they could find. It was quite blowy but we were sheltered, until we crested the dunes to walk along the main beach, when the full force of the westerly wind hit us, along with the sand being whipped up! We walked through the sand and shells, past the colourful beach huts and along the path towards Wells. The North Norfolk Triathlon taking place in the town and areas were inaccessible, so we returned the way we came and stopped at the café by the beach for a cuppa and sausage roll. 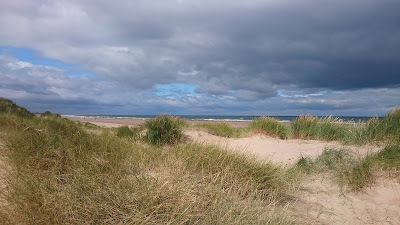 By now the tide had receded quite a way so we walked on the soft wet sand, although eventually the strong wind drove back over the dunes to walk along the other side in comparative shelter. Back at the van we had a cuppa and a chat while watching the crowds of walkers come and go. 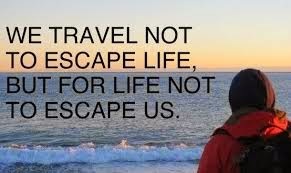 It seemed very busy to us but we've been spoiled by the quiet solitude of walking and swimming at Anglesey and on the Llyn. The rest of the afternoon was spent chilling out at the campsite, sitting out (and in when the rain passed through). 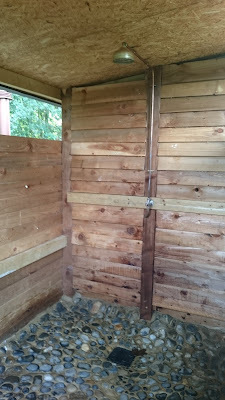 We both tried out the outdoor shower - you can't beat a hot shower while listening to the birdsong and with a cheeky breeze whistling around the crevices! Dinner was chicken pad Thai and rice, followed by rice pudding and a fresh blackberry coulis - perfect. Later we took a walk around at dusk, listening to the birds.